The bone anchored hearing aid is a wonderful advance for folks deaf in one ear and no more than minimal to mild hearing loss in the other ear. Surgery is outpatient, takes about an hour, and recovery is fairly quick. Insurance coverage can usually be arranged but generally requires appealing with the insurance carrier at multiple levels before surgery. 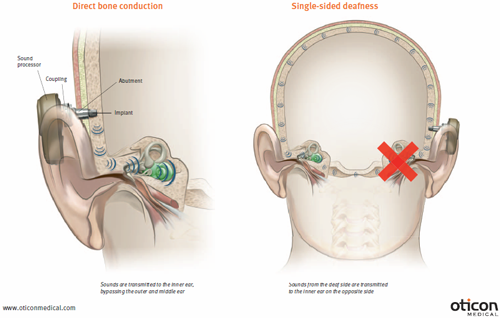 Generically called bone anchored hearing aids, these products provide a surgical solution for the diagnosis of single sided deafness or SSD as well as certain bilateral conductive hearing loss disorders. Read more about candidacy for this hearing loss solution here. This page focuses on surgical solutions. 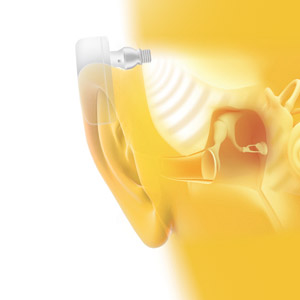 The devices from Oticon and Cochlear have an external abutment where the bone anchored hearing aid attaches and provide higher powered options. 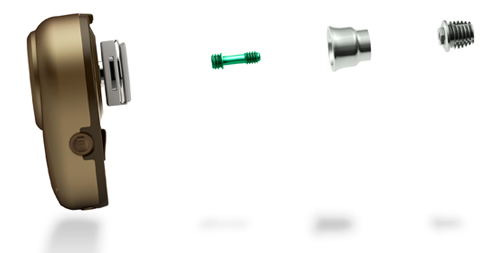 The device from Sophono uses an internal titanium implant and magnet to couple the bone anchored hearing aid without an external abutment however the fitting range is narrower. We provide a separate information page on Phonak CROS or BiCROS which are non-surgical solutions that may fit your needs. We would love to visit with you and help you sort through the various options that address your specific life stage, financial situation, aesthetics preferences, and accessory feature set preferences. It is our hope these pages provide you the information you need to make the best informed decision for your unique situation. The sound that enters the skull by means of the surgically implanted coupling device transmits through bone to the inner ear(s). Incoming sound enters the bone anchored hearing aid. The bone anchored hearing aid amplifies and converts sound to vibrations. 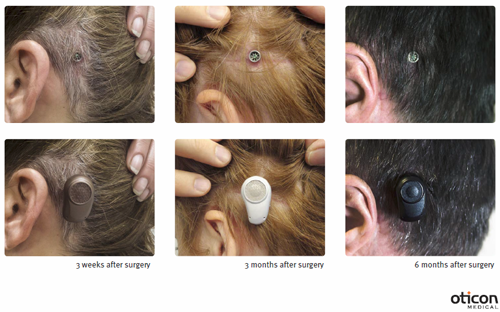 The device itself oscillates on the titanium post-coupling that is implanted into the skull. If one inner ear is notably better, the sound goes to the better ear. If one ear has a conductive hearing loss, but a normal inner ear, the sound goes preferentially to the conductive hearing loss ear. What does the BAHA look like? 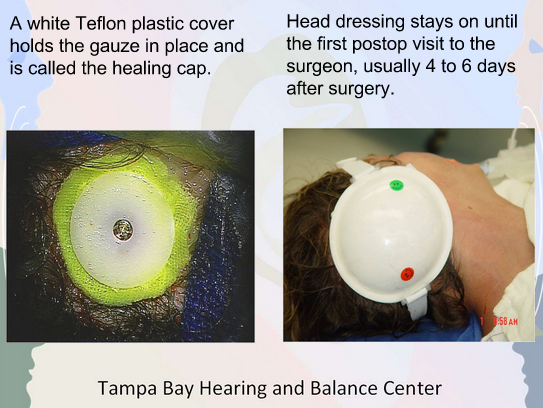 Leave the head dressing in place until the surgeon removes it at 4 to 6 days after surgery. Take antibiotics by mouth as prescribed. Pain medication is seldom needed for more than a day or so. After dressing removal, surgeon will specify further wound care instructions. Make a circular gauze to put around the titanium post screw coupling device. Cover the new circular gauze with antibiotic ointment. Place the gauze around the titanium post. Position the healing cap over the gauze to hold the gauze in place. No further need, typically, for the larger head dressing. Ask the surgeon when hair washing can resume, but it usually is allowed at 1 to 2 weeks after surgery. After washing and one other time per day, the gauze around the titanium post must be repositioned with antibiotic ointment that should cover where the titanium post comes through the skin. The titanium post screw coupling must heal in place for 2 months prior to tuning up and using the hearing aid that comes with it. You may ask for any of several colors to try to match your hair color.